Have you heard?! Our Cricut Collections are on sale - TODAY ONLY - at 30% off with a qualifying purchase of $30 in regularly priced items. 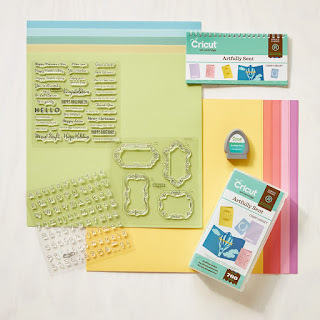 This makes for a great gift for yourself or that Cricut-lover on your gift list! 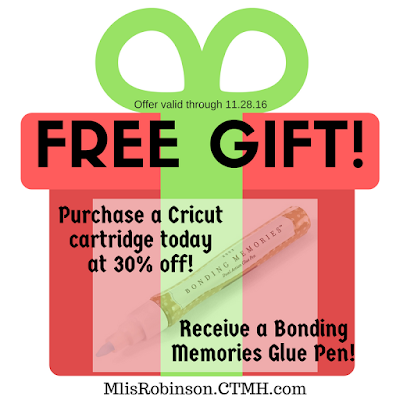 As a thank you gift, I will mail you a Bonding Memories Glue Pen that is perfect for assembling those Cricut images! You can find more details about the "craze" by visiting my website or refer to yesterday's blog post with additional information about each cartridge. Thank you for joining us for our Blog Hop where we are featuring the Flower Market Cricut Collection from Close To My Heart. 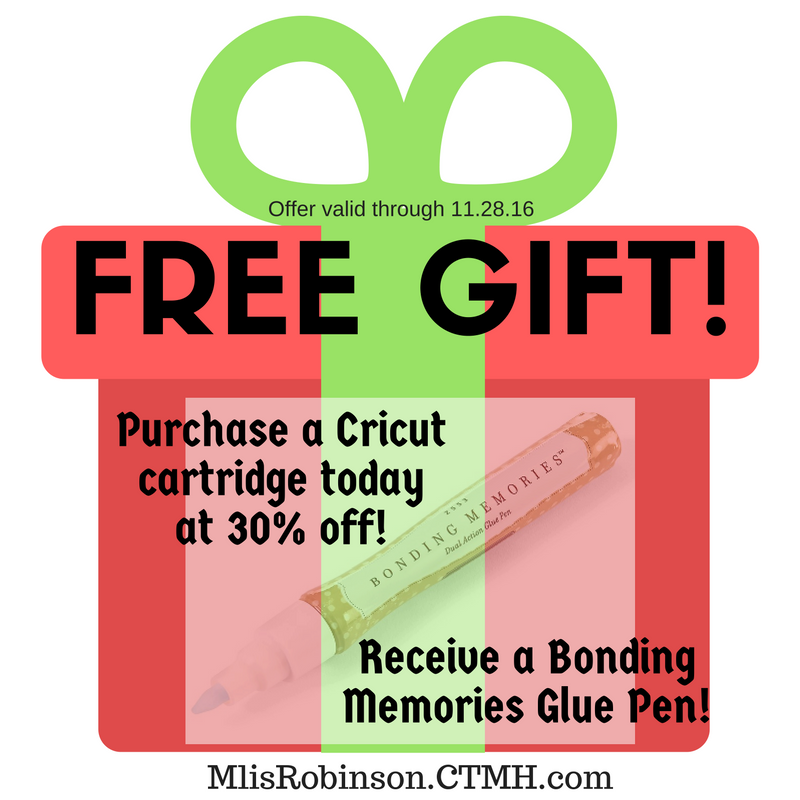 If you haven't already heard, we have a fabulous sale taking place tomorrow (Cyber Monday 2016) where you can save 30% off of our exclusive cartridges. You can click here for further details. If you are coming from Cat's Blog, you are on the right track. You can find a complete list of participants by clicking here. 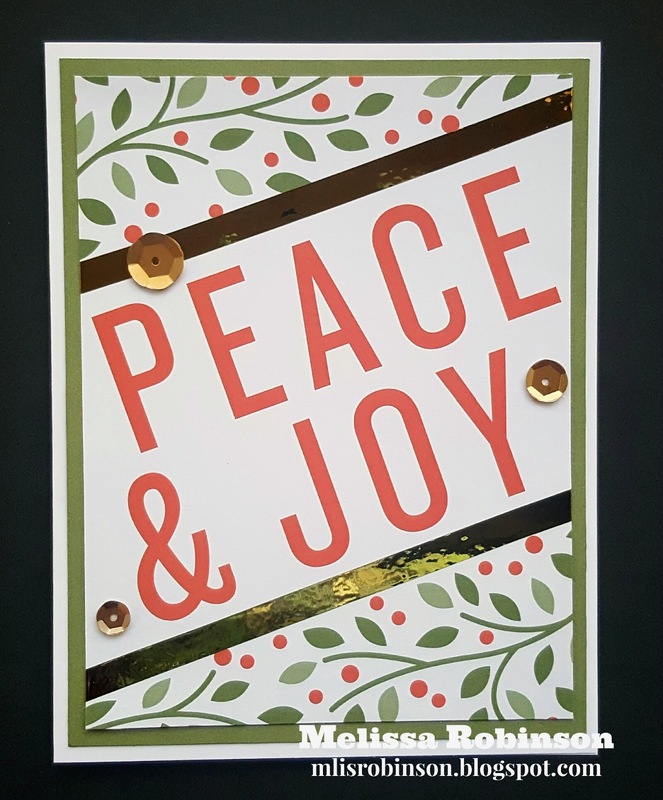 I decide to keep my artwork pretty simple, using only cardstock and a little bit of Washi Tape, in an effort to really focus on the pointsettias and layout title created with cuts from the Flower Market Cricut Collection. Here is a close-up of the largest pointsettia. I did not do any texturing, other than crinkling the leaves up a bit, and lifted up the edge of the flower petals because with it going in a scrapbook album I knew it would not be retained. Thank you for stopping by my blog and viewing my artwork. Now head on over to Wendy's Blog to see what she has created and to continue the hop. We appreciate you joining us. 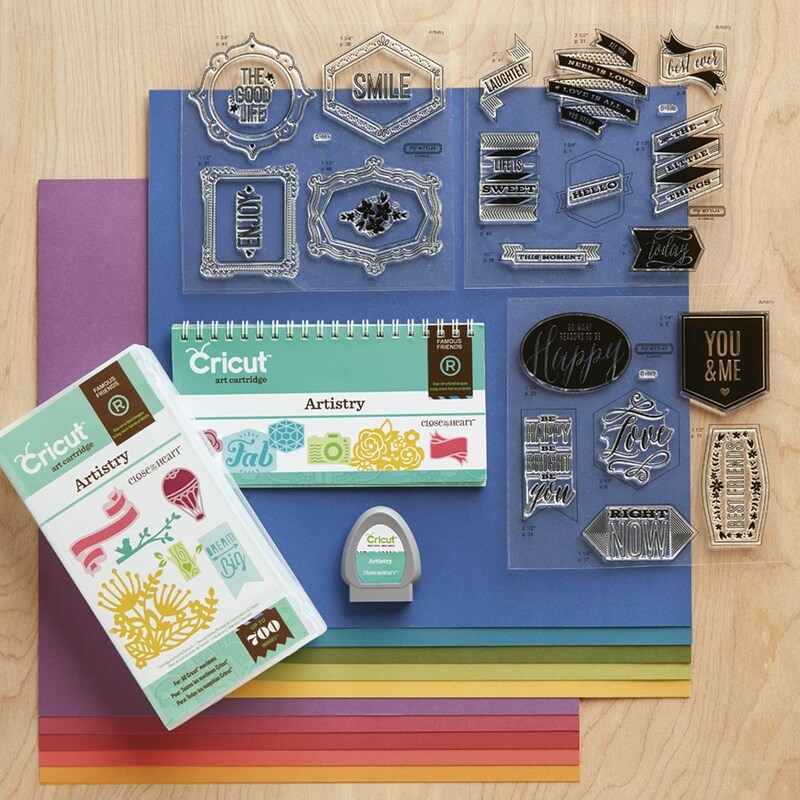 Are you CRICUT CRAZY and lacking in one of our fabulous and exclusive Cricut® Collections? You can buy one of four of our Collections at 30% off with a $30 purchase on Cyber Monday (11.28.16)! The sale begins at 12:00 am (MST) on Monday, November 28, and will last until 11:59 that same day. You can place your order at: http://mlisrobinson.ctmh.com. We have a variety of Collections to choose from as detailed below. I have all of the Collections and love every single one of them! 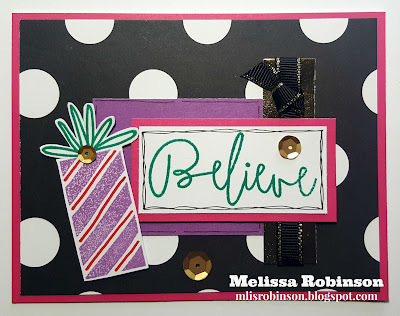 Cardmaking has never been easier or more fun! 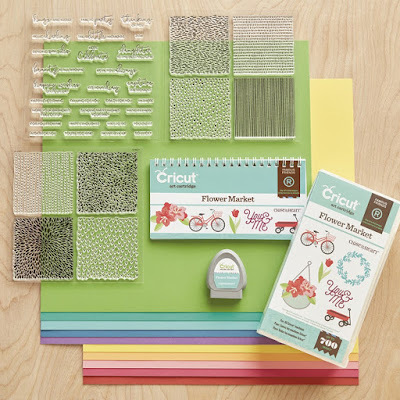 With this Cricut®collection, you can make handmade masterpieces in no time at all. 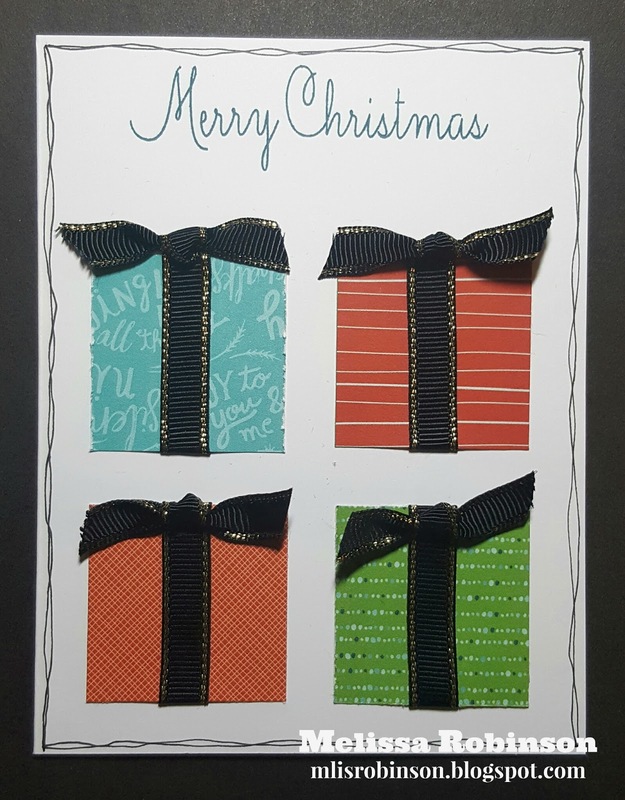 Choose from cards with sentiments cut directly into them, or combine several cutouts to create your own pop-up scenes. Featuring more than 25 different card themes and 5 different card formats including dynamic interactive designs, this cartridge has a card for any and all occasions—even if the occasion is "just because!" 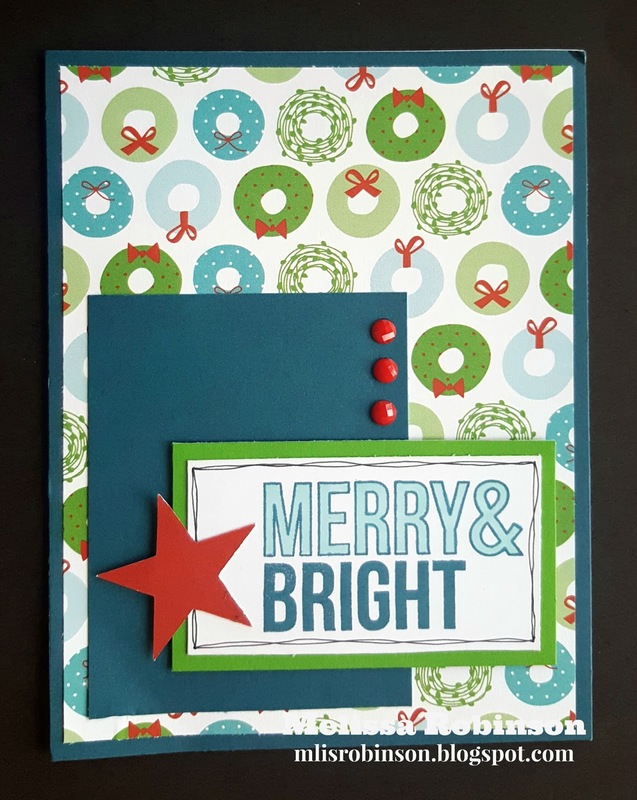 Card styles include pop-ups, scenes, sentiments, sleeves, and pocket cards. Let me know if you have any questions on the cartridges. They are exclusive to Close To My Heart and are great for your papercrafting projects. WATCH TOMORROW MORNING'S POST WHICH WILL HAVE INFORMATION REGARDING A THANK YOU GIFT YOU WILL RECEIVE IF YOU TAKE ADVANTAGE OF THIS SPECIAL! Join my special event where there will be Close To My Heart specials offered throughout the day today in honor of "Shop Small Saturday". The fun begins at 9 am CST and new specials will be shared every three hours (12 noon, 3 pm, 6 pm and 9 pm). I will also be giving away prizes and everyone will receive a special thank you gift from me, to include a handmade greeting card. I would thoroughly appreciate your business and look forward to a fun day! It is a great way to check off items off your wish list or to get someone a gift they will love this year! Please feel free to share this information with anyone you think may be interested. The more, the merrier! I have a fabulous Black Friday sale taking place on my website right now! (Offer only available while supplies last!) You can read more details about the Surprise Stash campaign by clicking HERE. THERE ARE 15 BUNDLES TO CHOOSE FROM; TODAY ONLY! 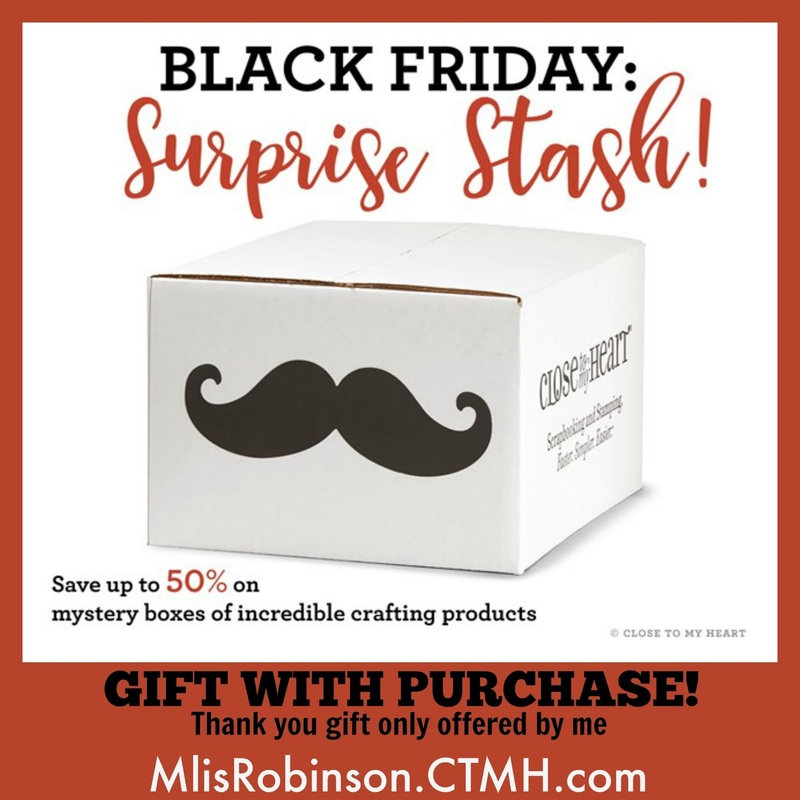 Choose from a selection of mystery boxes containing products themed for scrapbooking, cardmaking, or both! Happy fun saving some money today! Love getting a great deal on crafting supplies to add to your..."stash"? 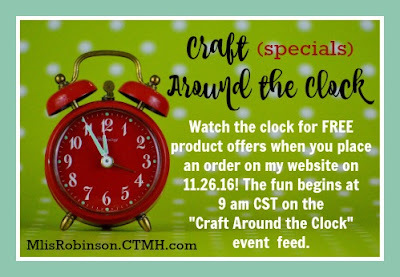 For Black Friday this year you will have the opportunity to get amazing crafting supplies at an amazing price with Close To My Heart! For 24 hours only, we will featured themed mystery boxes filled with retired Close To My Heart products, all at a major discount! These mystery boxes will have five different price points ranging from $35 to $150, with some mystery boxes being offered at 50% off the retail value! All mystery boxes will be available beginning November 25, 2016 at 12:00 am (MST) while supplies last - so grab a box for your stash before they are gone! Read below for a few more details regarding this one-day offer! The mystery boxes will be made available in five tiers - $35, $50, $75, $140, $115, $150. Some boxes may contain items included in other mystery boxes, at other price points. You may receive duplicate items in the mystery boxes. Many of the items included in the mystery boxes are considered consumable, which just means that having more than one would be even better! In the instances that duplicates are included, we won’t put more than two identical items in a single mystery box. If you have any questions, let me know! I am sending everyone a thank you gift who takes advantage of this special offer with the value of at least 10% of the bundle price. It will be mailed to you directly. Place your order at MlisRobinson.CTMH.com. 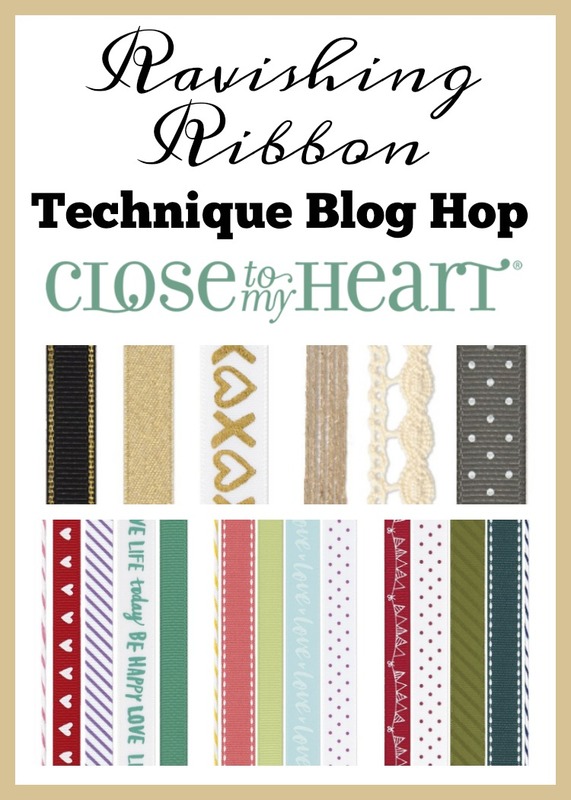 Today we are focusing on ribbon and Close To My Heart released some fun and exclusive Ribbon Packs and I love them...ALL OF THEM! 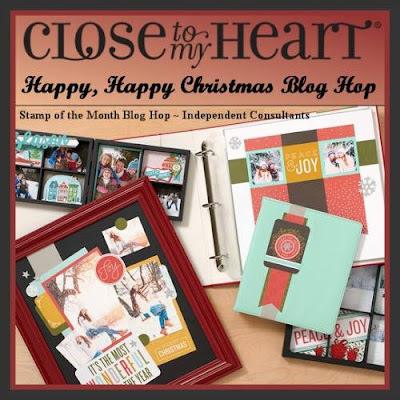 It will be fun to see how the Blog Hop participants chose to incorporate it into their artwork. If you are coming from Tammy's Blog you are on the right track. You can find a complete list of participants at the bottom of this post, if you were to get lost along the way. To highlight the ribbon, I chose to keep my card simple and that it is! Just four pieces of patterned paper cut in 1.5" squares, some ribbon, and a stamped sentiment. TADA! It cannot get any simpler than that, can it?! Thank you for visiting my blog and joining us on this hop. Please head on over to Wendy's Blog to see how she incorporated ribbon on her project. Our new 2017 Planner has been released and it includes coloring pages! You HAVE to check out this video and then read below to know how you can get one in your hands on one! 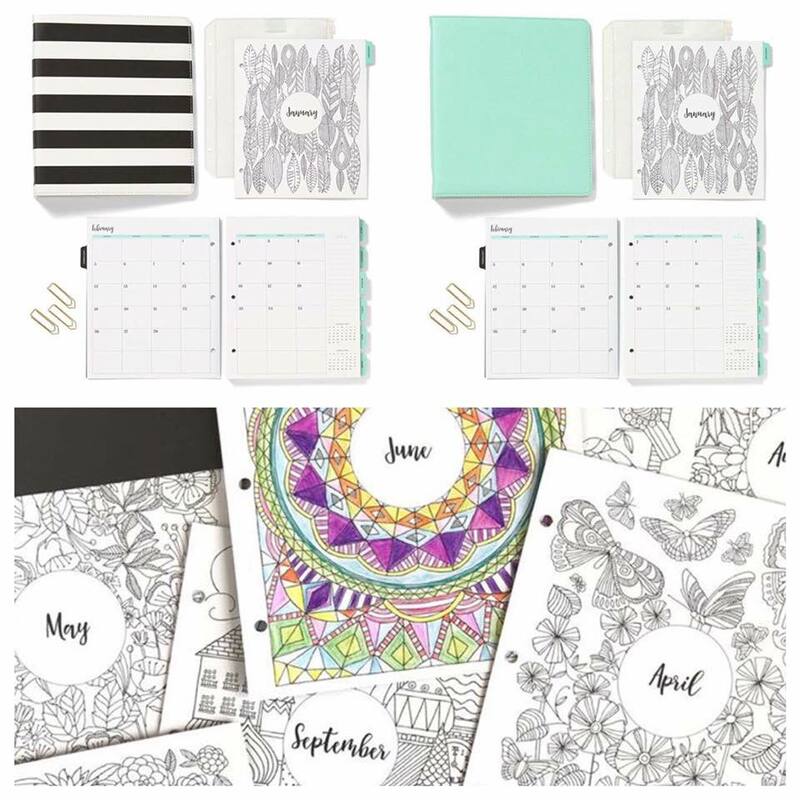 You can elect to purchase the refills or we have some beautiful new album/planner covers to start out fresh! 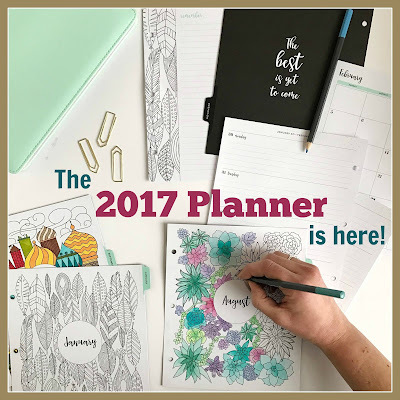 You can check out the Planner supplies by clicking HERE. The Planner Bundle contains all you need to get started, or to continue planning, and includes either the Everyday Life Sea Glass or Stripes (black & white) Album, the 2017 Planner Pages, a clear pencil bag and three gold paperclips. If you order the Planner Bundle I will send you a roll of this pack of Washi Tape for FREE - as a THANK YOU! 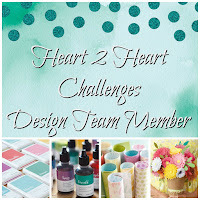 I do have a Facebook Party taking place and you are welcome to join the fun as I share more details about the Planner and other related products! OR...let me know if you want to host a party of your own to earn your planner (or at least $25 in Hostess Rewards) FREE! Contact me for details! Let me know if you have any questions. Have a wonderful weekend! 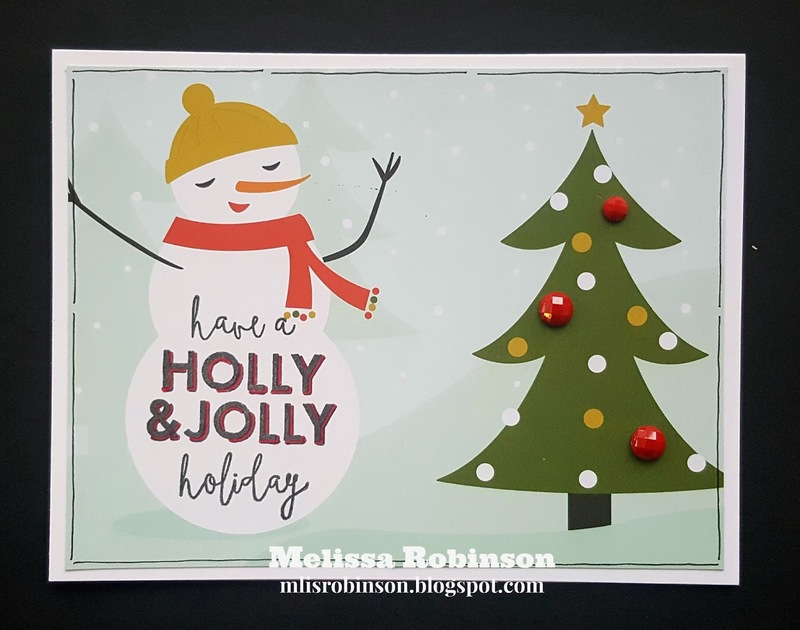 Thank you for joining us for this week's Heart 2 Heart Challenge where you are asked to create Christmas-themed artwork using non-traditional colors. I am excited to see the color combinations everyone uses. 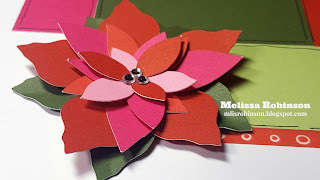 The colors of cardstock I incorporated are Raspberry and Pansy. I stamped the sentiment in Emerald. The stamp set I used is Jolly Holiday. 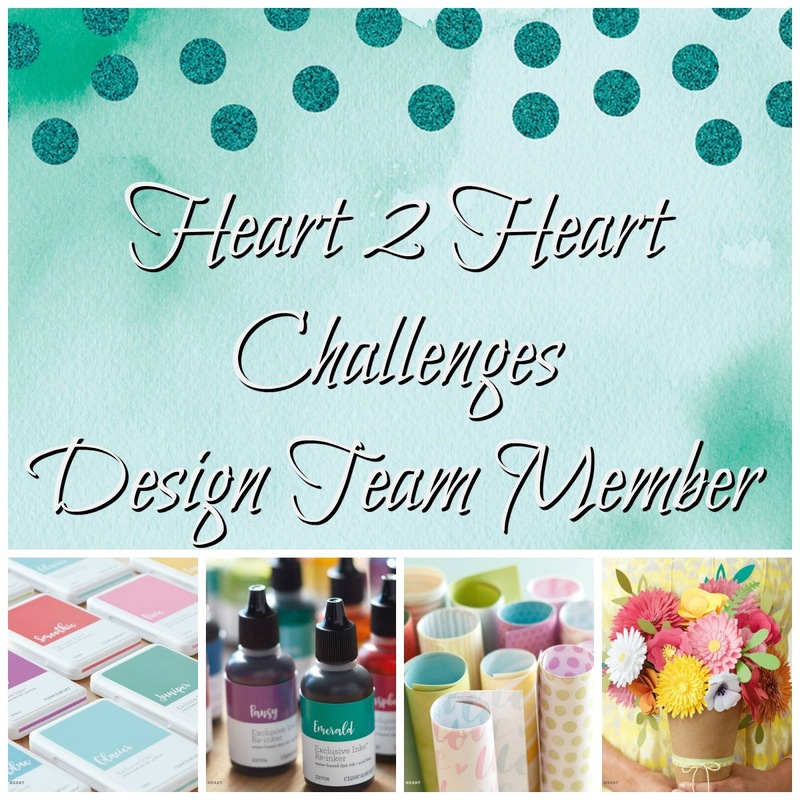 Consider linking up to this week's challenge and be sure to use Close To My Heart products when you do. I look forward to seeing your artwork. 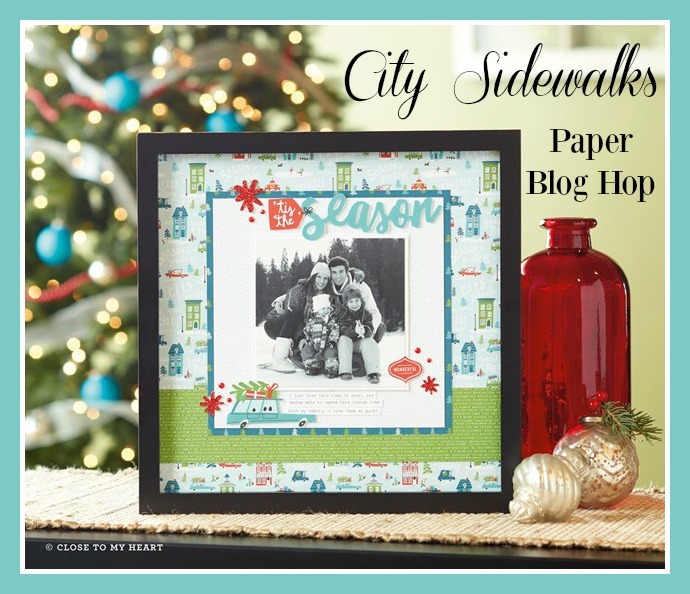 Thank you for joining us as we highlight the City Sidewalks paper pack from Close To My Heart. This fun and whimsical paper pack has fun holiday/Christmas patterns, perfect for preserving your holiday memories, creating greeting cards, or for any other project you desire to create. Check out the full product line of City Sidewalks by clicking here. 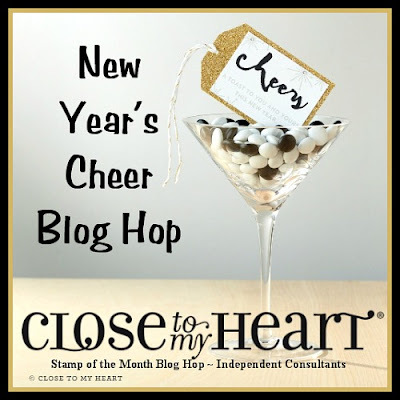 If you are coming from Debi's Blog, you are on the right track. You can find a complete list of participants at the bottom of this post. The sentiment is from the stamp set, "Perfect Presents". It is intended for gift tags cut with the Cricut but you can see how they can be used otherwise. 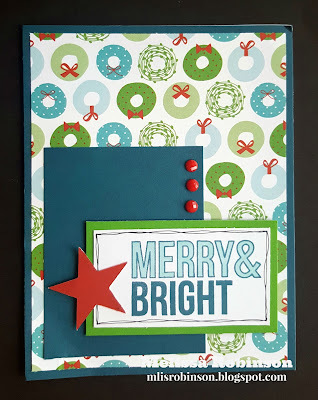 I stamped the image in Peacock ink pad and then used the ShinHan Turquoise Blue Marker to color in "Merry &". Of course I had to add in some doodling using the Journaling Pen. 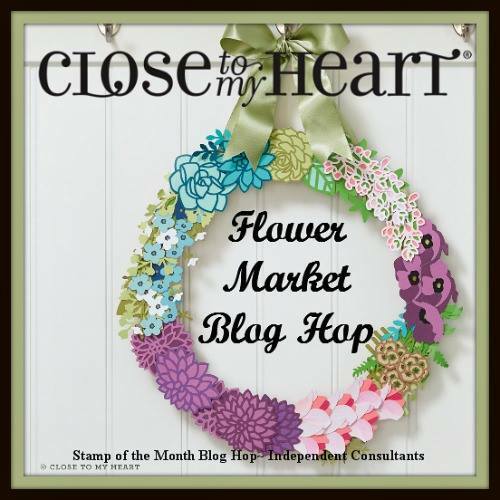 Thank you for checking out our blog hop. Now head on over to Katy's Blog where you are sure to be inspired. 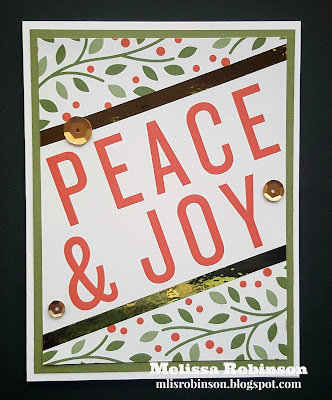 Welcome to this month's Stamp of the Month Blog Hop where we are highlighting a stamp set designed to ring in the new year! WHAT?! 2017 is almost here?! Yes, and it's totally crazy since we embarked on November today. Where does the time go?! 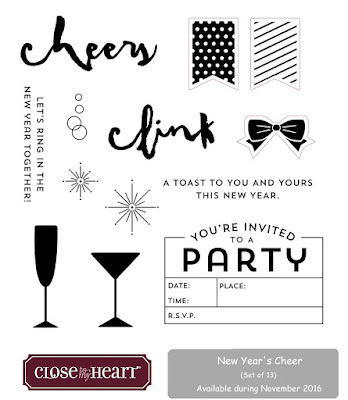 This fun stamp set, "New Year's Cheer", has a variety of images to ring in the new year but I also see some great potential beyond that theme. 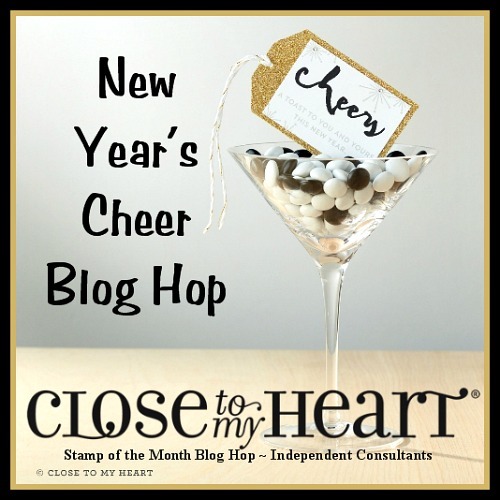 I am looking forward to seeing what the other blog hop participants created and I hope you are too! 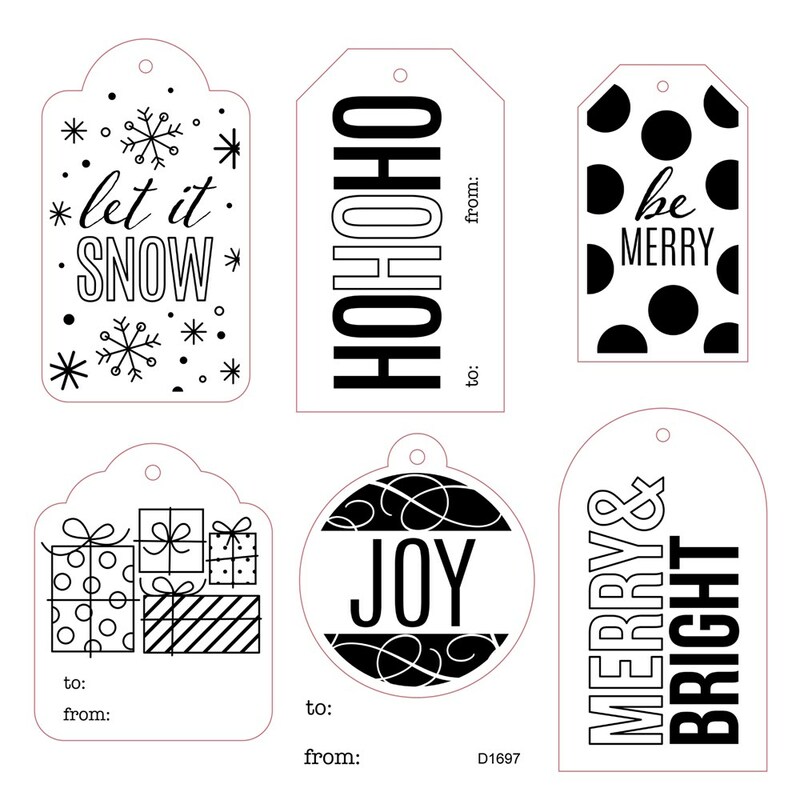 This stamp set is available, this month only, for just $5 with a qualifying purchase. You can find complete details on this offer by clicking here. If you are coming from Wendy's Blog, you are on the right track. You can find a complete list of participants by clicking here, should you get lost along the way. 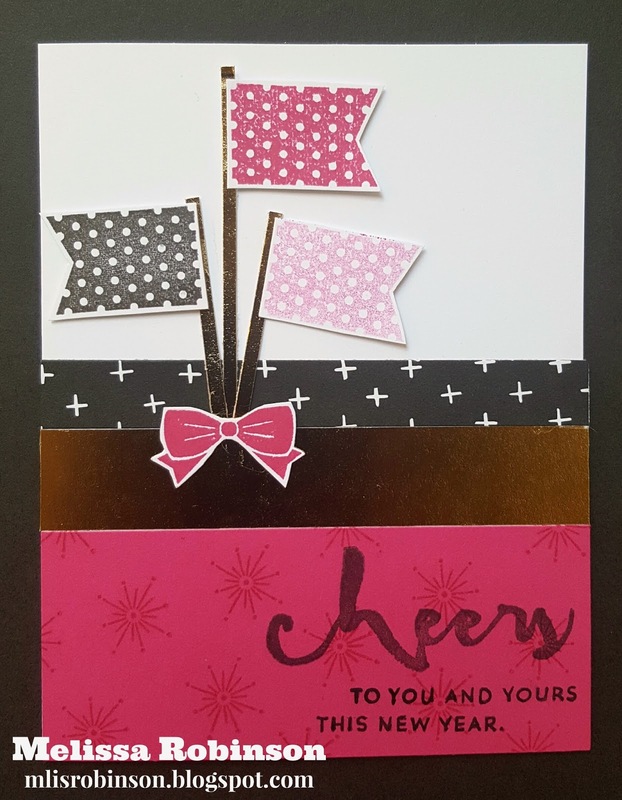 It was fun making this card, still celebrating the new year, but using the banners as flags. And...isn't that bow adorable?! I see using it with some other images besides those included with this exclusive stamp set. The colors used were Black and Raspberry. "What about the pink color", you ask? That is just the second generation of Raspberry. (I stamped the Raspberry banner and then stamped it again, without reinking the image, to get the lighter shade of pink. Cool, huh?) The gold strip of paper was trimmed from the Uptown Fundamentals Paper Pack (it is beautiful). The flagpoles were also cut from that paper. When my artwork needs a "little something else", I like doing tone-on-tone random-stamping as you see done on the piece of Raspberry cardstock. 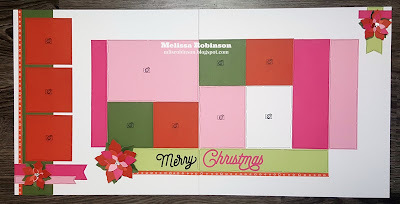 Consider leaving a comment and then head on over to Melinda's Blog. She always has such creative and fun artwork to share. You will definitely not be disappointed.